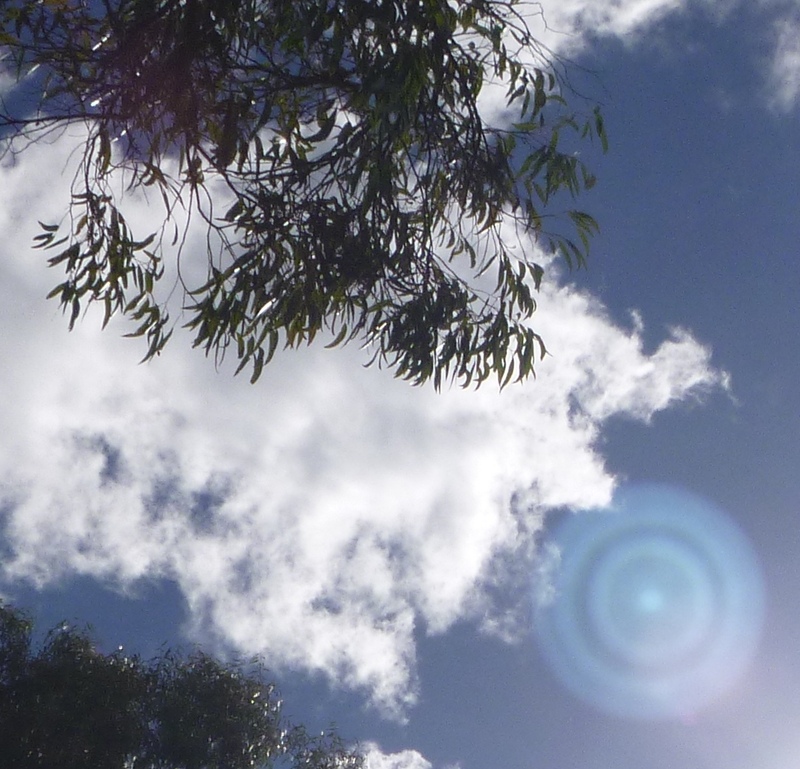 Following on from the last post about contact with star family, today I’d like to speak about the frequency of our gaze: what template or filters are we viewing through, those that create limitation, or those that create expansion? And what does this mean for the transformative process we call the Shift? What does it mean to really ‘see through the heart’? Photo May 11th, 2014, Darlington, Western Australia. These photos give a lovely view of the ship through to the 3D – third density – template. You could say the camera’s rendition of the ship is pressing its representation into 3D. Through this ‘gaze’, we might assume this craft is a flat disc, and if it were to turn sideways, it would present a narrow profile, in iconic ‘UFO style’. Seeing through the filter of the 3D gaze, however, is very different to seeing through 5D – fifth density – and higher densities. (It helps to see 5D as a zone of access for higher and lower – or faster and slower – frequencies. While sixth density and above are beyond physical form, beings residing in those densities can and do project representations of their energies into 5D. And the zero-point bridge of 4D – fourth density – allows access to lower/slower densities). In the example of this ship, 3D representation shows an upright/vertical disc with flat rings of blue-green. 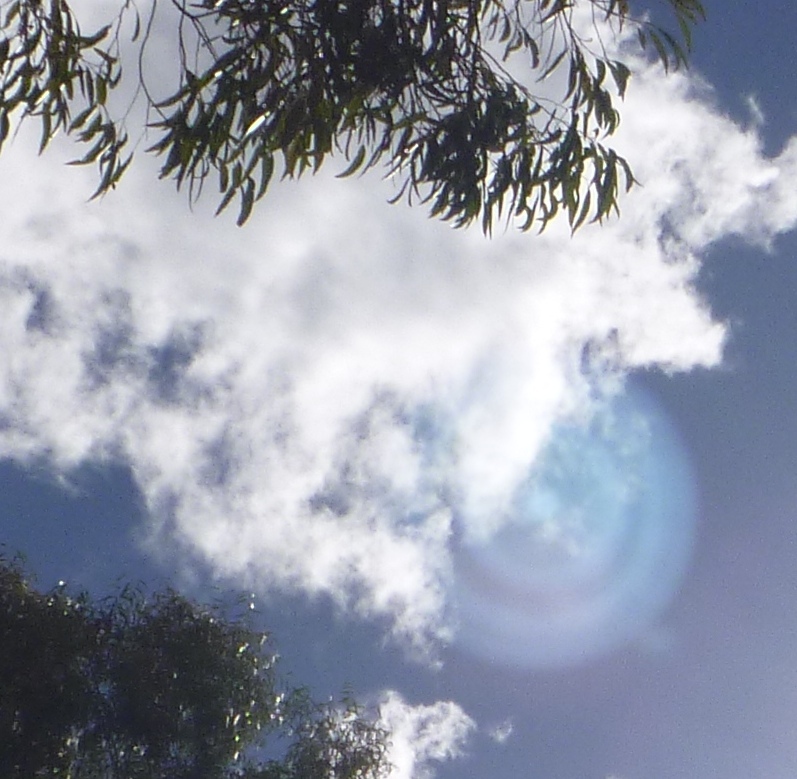 My inner Eye sees a multi-dimensional silvery sphere, crystal-cored, with constantly moving rings of crystalline blue-green, radiating Light. The Light ‘informs’ (IN-forms) the collective creative agreement of the ship’s occupants as to its form, which expresses many beautiful, functional perceptions, aligned and fused as One. I speak of the ship as a multi-dimensional sphere, because if you moved around it, you would always see in 3D the vertical, ringed disc, from any angle. The ringed disc is a symbolic translation into 3D-4D of a ship that is faceted across frequencies; imagine a diamond in which every facet is cut exactly the same…just so, the ringed disc is like one of those facets, visible from every side….but it is not the Whole of the diamond, although each facet carries the vibration of the whole diamond. To exist, or be wholly focused into a higher density state is to experience the ‘whole diamond’ rather than the limited projection of 3D. Feel this in relation to the dualistic constructs we use to define this level of ‘reality’; religions based on high v. low, spirit v. body; political structures whose polar conflict is profit v. people, or profit v. planet; art and music expressing love v. hate, joy v. sorrow, faith v. cynicism, head v. heart. And so on. This is the frequency zone of division, for the experience of contrast. The contrast frequency is embedded in everything existing in third density, and dictates human beliefs and perception at every level, until souls make a choice to move back into unity, and start to – and eventually completely – embody a unifying frequency (Ascension). Feel now into the ‘spiritual constructs’ of the 3D template. For example, the old chakra system, with its seven chakras from base to crown, expresses through an etheric circuitry of pathways – nadis and vrrtis – all the contrasts of the 3D template (such as the fear, anger, and peevishness vrttis of the solar plexus chakra, or the hope, attachment and love vrttis of the heart chakra) available to experience as a 3D human being. 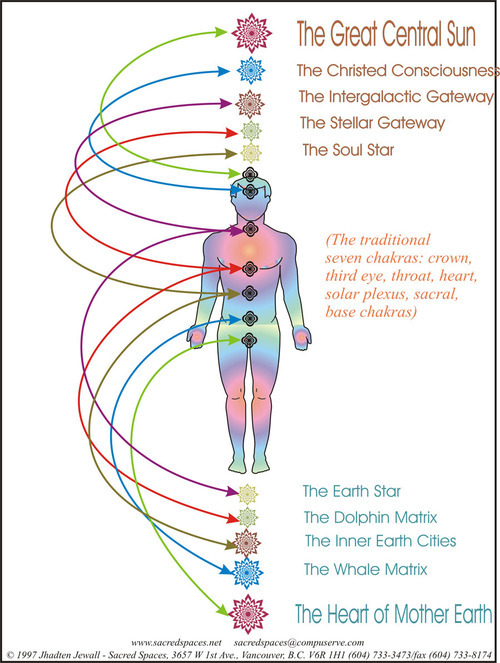 Now, with the potential to shift beyond ‘polarity mode’ opened, the seven chakra system within your own BEing can be refined – and redefined – to extend and expand from the ‘facet’ to the ‘whole diamond’, via new chakras becoming available as our frequencies rise (such as the Earth Star and Soul Star chakras beyond the physical body, two new heart chakras, and new smaller ‘tuning IN’ chakras like the Well of Dreams and Pituitary chakras in the head. There are others; I’ll write a post on them soon). The old system has to expand, and its old survival codings dissolve, which can be assisted by ‘tuning up’ the chakras (see the example practice at the end of this post)….until, ultimately, they become One. Astrology is another construct ready to transform. But wait, the planets and stars are real, and they do form definite energy lines (aspects) as they move through space and time! Totally true…in this relative space and time zone of third density. Now imagine for a moment dimensions in which ‘time’ and ‘space’ are completely different to their 3D appearance, lived and experienced very differently, and try fitting traditional astrology into that reality. The planets still exist, and the stars, along with planets and stars that exist only in higher frequencies. Already, the picture looks very different, doesn’t it? 3D astrology is founded on the polarity energies of harmony, conflict, conjunction and opposition and so forth that express (and dictate) the duality frame. For instance, feel into a basic aspect, an opposition, where two planets are positioned opposite each other on the wheel of the chart. Traditionally, this is seen as an antagonistic aspect, where the points of view of the two people, or inner parts of one’s psyche represented by the two planets, are opposed to each other, unable to see through each other’s viewpoint. More evolved astrology will say this can be remedied by the two opposers meeting in the centre, and this is the ideal of resolution in third density. However, in fifth density and higher, no such energy as an opposition exists. (There may be/are beings in lower density bands who regard fifth+ dimensional beings as ‘enemies’, but that is not the view held from within fifth density+). From higher frequency viewing, everything returns to Love, to stratas of unity, in its own pace. Everything. When higher density beings are dealing with the distortions and disparity of slower frequencies, they do so from an integral feeling and understanding of Oneness. If our purpose is to establish our experience and expression in higher density light crystalline bodies, in bliss, ease and love, then freeing our thought patterns from attachment to duality as our dominant frame of reference is part of our journey. We have the opportunity to unmap everything we think we know…and know that it’s not frightening, it’s wonderful! Letting go opens the door to liberation from eons of limiting frameworks our souls agreed to operate within as we rebalanced polarized energies of many lifetimes. We can keep agreeing, or move on, and allow the bindings to dissolve away……to feel the great vastness of the abyss….and then perceive how it is filled with Light, and the magic of all potential, the field of Love. Instead of mapping ‘timelines’ (‘linearity’ being 3D mode) onto that sparkling sea of potential, feel ‘time’ as spiralling energy moving in and out of zero point. Feel the energy of the spiral. How does it feel compared to the line? Does it feel more like your own organic nature, your DNA, your atomic wheeling geometry? Can you breathe more easily within it than trying to fit your experience into a line? Feel the nature of a higher frequency viewing point – your unique viewing point in all the Universes – radiating from your Essence, and let that slide gracefully through all your old maps and turn them to Light. They will only become more beautiful. 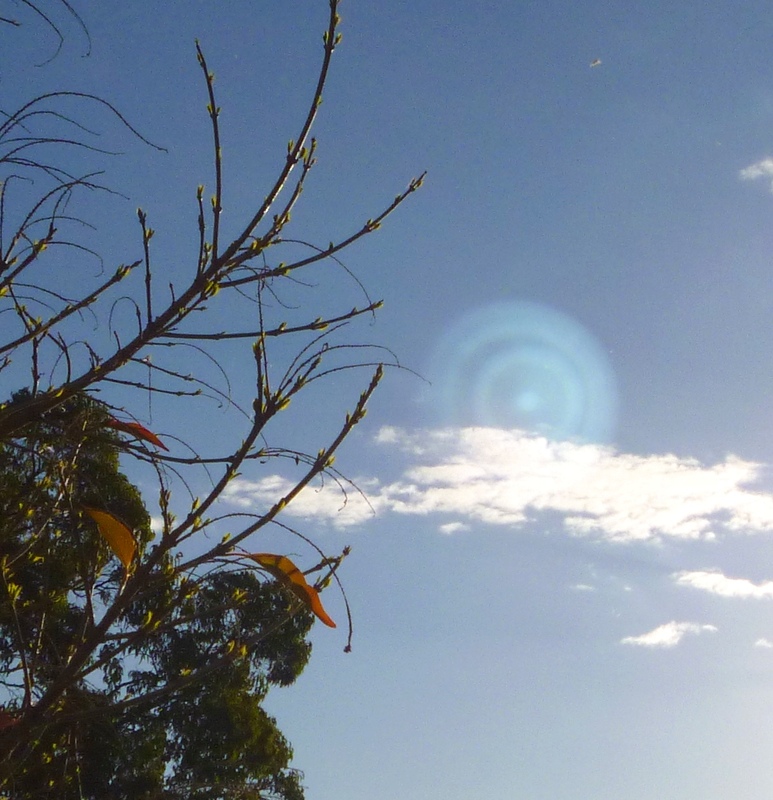 ‘Mastery of Time and Space is inherent in rings and spirals.’ Photo May 11, 2014. Stay relaxed, yet aware. Feel the resonance in your words and those around you. Our languages of 3D are ‘duality artifacts’……I smile now at this post, with words incapable of expressing the states of being I’m trying to describe…..they can only give a hint of them, and a ‘call’ to journey deeper INward. Be alert to the ‘clues’ in words, in what you read or hear that purports to lead you into wisdom or knowledge, in books, channelings and messages like this one! Feel the energies behind words. If you find something ‘enthralling’or ‘captivating’, for instance, what part of you is giving its power away, to become a thrall or captive? Do messages inciting revolution or rebellion lead to freedom or are they locking you into the duality energy of ‘against’? How does it feel to see yourself and the world in a state of evolution rather than revolution – of very fast evolution accelerated by Divine decree and supported by countless beings of Light? We have the ability to liberate our words and let communications flow through our hearts and shape themselves in resonance with the New. Centre in your heart, breathe deeply and connect with love to the Divine Mother. Send your love to the core of Gaia’s Earth, and wait until she returns love to your heart. Send your love through your crown to the Divine Father, and wait until his love returns to your heart. Feel it merge with the Mother energy and spread through your Being. See your Heart Centre as a radiant star. Now see your Earth Star chakra, below your feet, as a radiant star, and likewise the Soul Star chakra, above your head. Feel the balance between the three, and relax into that state of pure balance and openness. Open your base chakra (red), sacral chakra (orange), solar plexus (yellow), sacred heart (behind the xyphoid process, peachy gold), heart (green), higher heart (midway between heart and throat, gold and purple), throat (blue), third eye (violet) and crown (white). 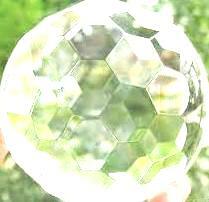 Now return to the base, and visualize each chakra turning into a golden ball of light, up to the crown. Check their balance; if any are fainter than the rest, give them more light. Return to the base again, and visualize within the ball of golden light a pure gold butterfly, its wings fluttering so fast they are just visible. Add a butterfly to each chakra. Hold this vision of butterflies in each chakra, while maintaining the radiant star of the Earth Star, Heart and Soul Star chakras. 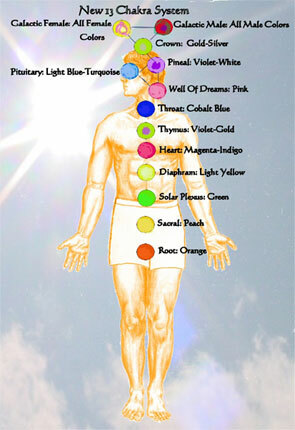 Later on, you can bring new smaller chakras into this exercise, but I would start with the central chakra column. Below are some depictions of new chakras, added to the old. Some of the colours are different to my seeing of them, but the general idea is there. * Before opening your chakras, always use a practice like the Golden Apple, or another practice of your choice that gives your personal torus a Light envelope, within the field of dense energies of 3D-4D. The Golden Apple can be found in the post Three Foundational Heart Practices on the Practices page on this site. This entry was posted in Ascension, Chakras, Dimensions, Lightships and tagged 5D, aliens, astrology, Bareld Nijboer, Celia Fenn, chakras, dualism, ETs, fifth dimension, galactic family, Galactic Federation, galactics, higher self, lightships, star family, starships, UFOs by Joanna. Bookmark the permalink.